We're excited to be an Amazon Associate. By using the Amazon links found throughout this site, you can show us your support without even thinking about it! Check out the new Black BadOrigami t-shirts, coffee mugs and more! Visit the store for the complete list of products. We've added illustrated, step-by-step instructions that walk you through the folding of the classic origami crane. Legend says that if you fold one thousand cranes, your wish will come true. Can the simple act of folding paper, while sharing a drink and good food, serve as a guide for conducting the rest of your busy life? We think so and Bad Origami will share all you need to know to get started. So you found some pretty paper and you want to make something of it? Visit the next two sections to prepare, then come back here to get instructions. New folds are coming soon! What fun would folding paper be if all your creases were straight? Appreciating Bad Origami means sharing a few good cocktails or beers. Find a few of our favorite latin-american concoctions here. All new cocktails just added! A Bad Origami host needs to be prepared for those impromptu, late-night folding-fests. Snacks beat out meals, so here's our favorite foods to fold by. All new recipes just added! OMG Black Shirts! No way? Way! Celebrate the Bad Origami lifestyle by wearing, toting, throwing, mousing or drinking from a great selection of badorigami.com wares. 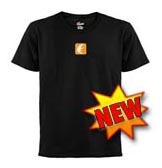 Hosted by CafePress, you can shop and order securely online. We're an Amazon Associate, so please use the Amazon links found throughout this site and you'll support BadOrigami.com. Questions? Comments? Requests? Send them to us here. Visit the Bad Origami Store online. Contact Us. Copyright © 2003-2005 BadOrigami.com. All rights reserved.